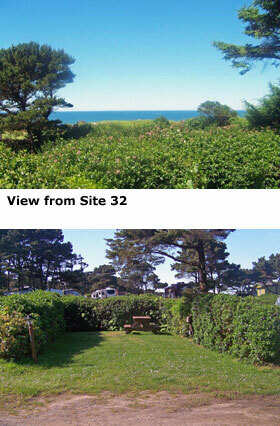 You can compare photos of different sites. 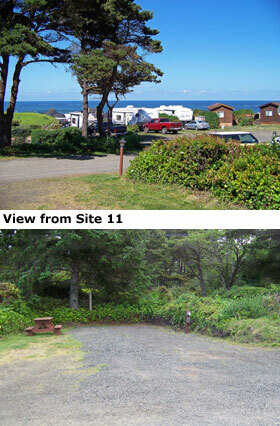 Click each campground site number to view two photos of that site. Use Landscape Mode with cell phones. 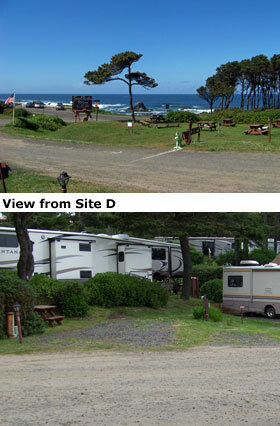 We can assist you in finding the most suitable sites for your campground stay. Just contact us! 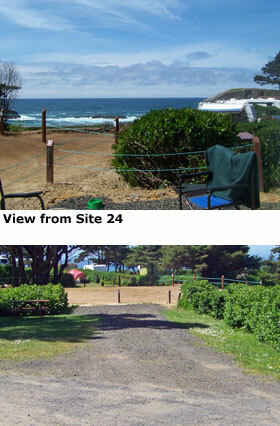 To compare 2 or more sites, click site number to produce photo window. Then drag each photo to put them side-by-side. Click again on a photo to dismiss it. Photos will not drag on cell phones. 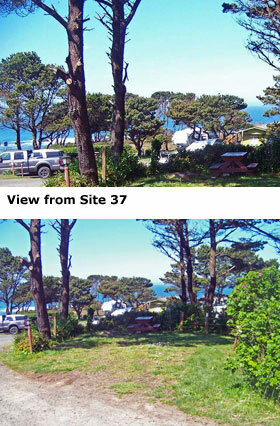 Site 31 - Popular tent site with Ocean View. Site 32 - Tent site with hedges on 3 sides. 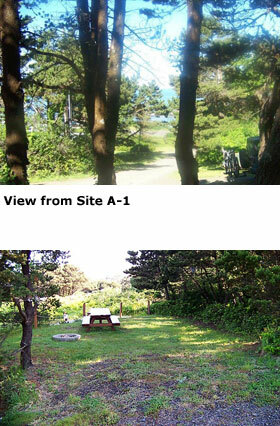 Ocean can be seen from most of tent area. Site 32a - Tent site with hedges on 3 sides. 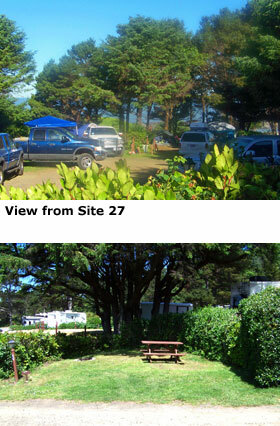 Ocean can be seen from most of tent area. 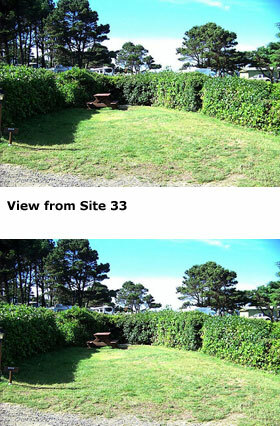 Site 33 - Tent site with hedges on 3 sides. 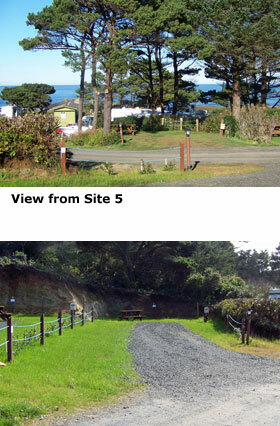 Ocean can be seen from most of tent area. 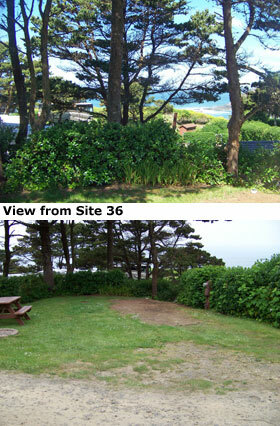 Site 34 - Tent site next to restrooms with hedges on 3 sides. 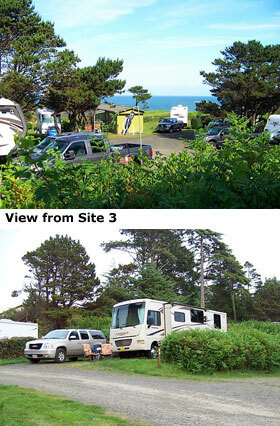 Site 36 - Small, wide RV site with nice view from rear. 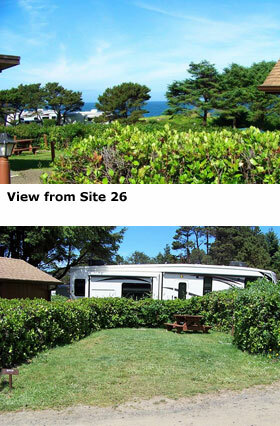 Site 37 - Small RV site with nice view from rear. 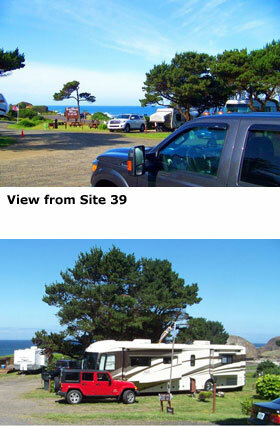 Site 38 - Large RV site with nice view. 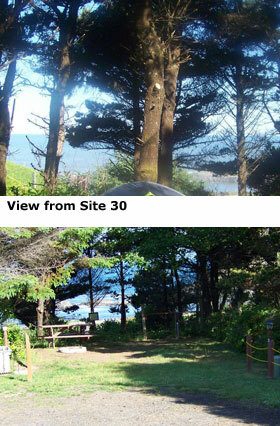 Site 39 - Large site with trees and some view of the ocean. 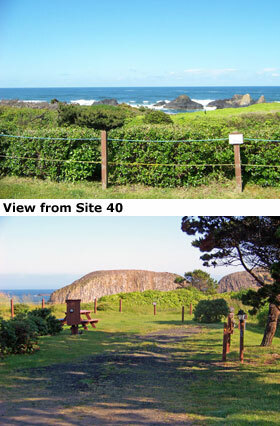 Site 40 - Popular Ocean View Site. Has 50-amp on both sides. Drive in and look. 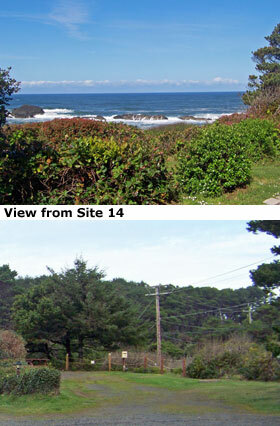 Site 41 - Popular Ocean View RV site. 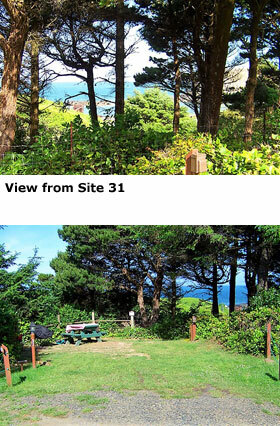 Site 43 - RV site with Ocean View out of rear. 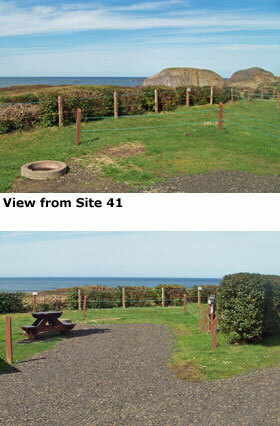 Site 44 - Popular Ocean View RV site. Office - On the right side. Site A-3 - Smaller View RV site located up the hill behind the office. 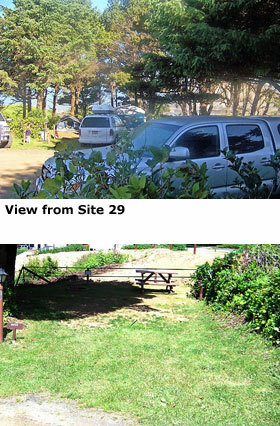 Site A-2 - View RV site located up the hill behind the office. Large concrete pad east of RV pad. Site C - Small view RV site. Site D - View RV Site with shade tree. 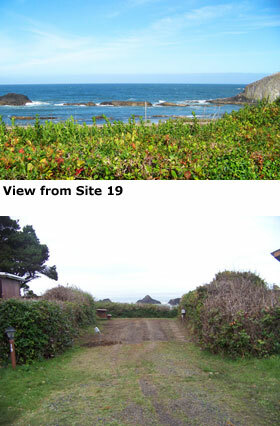 Site 1 - Ocean view. Large enough for big rigs. 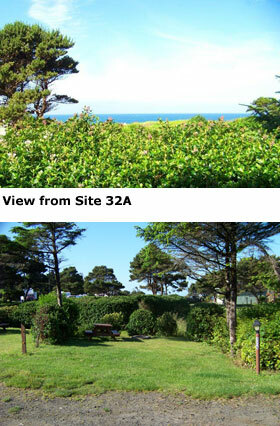 Site 2 - Ocean view. Large enough for big rigs. Site 3 - Nice view over hedges. Extra wide. 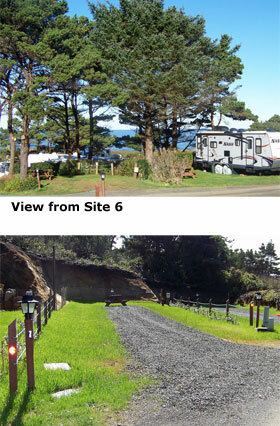 Site 4 - Private RV site. 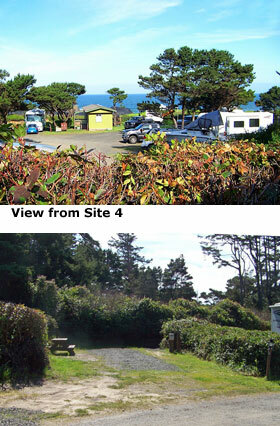 Site 5 - Large 50-amp RV site. 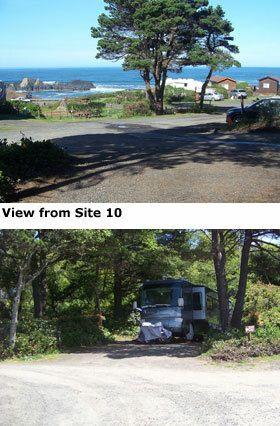 Site 6 - Large 50-amp RV site. 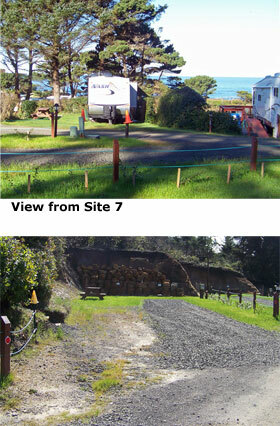 Site 7 - Large 50-amp RV site. Site 8 - Pull through RV site. Some view over hedges. Site 9 - Large and long pull through. 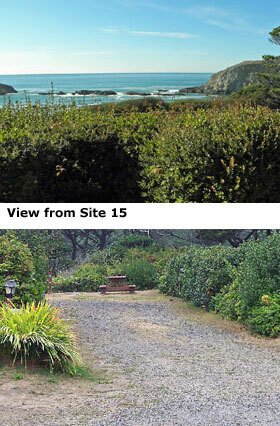 Site 10 - Large Site, Very nice side yard with fire pit and table. Lots of Ocean to see from here. 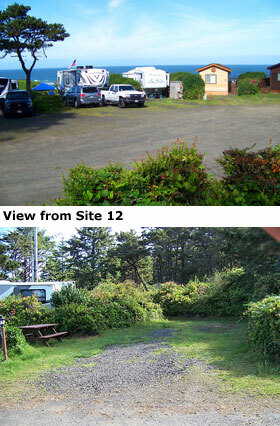 Site 11 - Private RV site. Distant view of ocean. 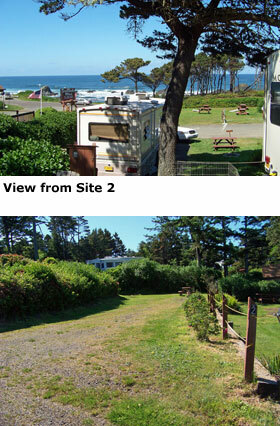 Site 12 - Private, some view from west front of RV site. 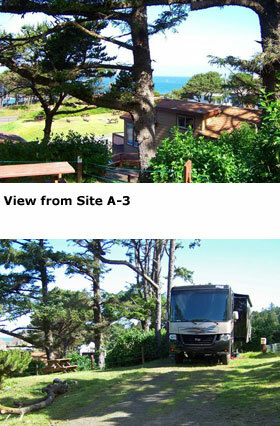 Site 13 - Private, some view from front of RV site. 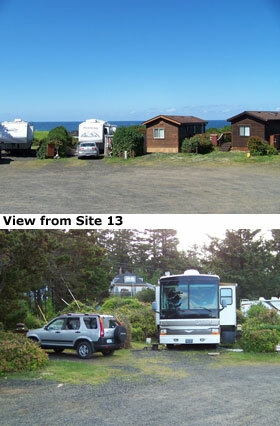 Site 14 - Popular large Ocean View RV site. 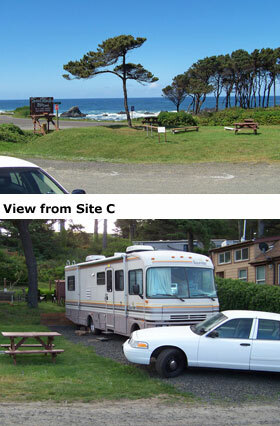 Site 15 - Popular Ocean View RV site. 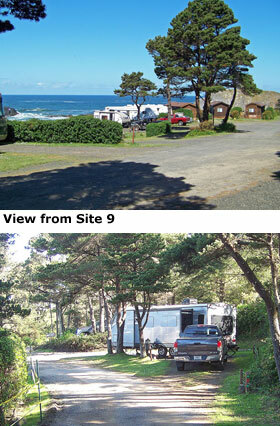 Site 18 - Great Ocean View RV site. 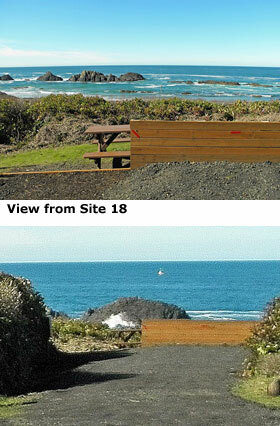 Site 19 - Great Ocean View RV site. 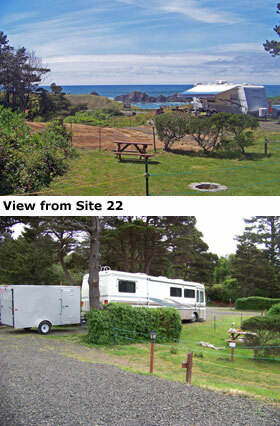 Site 20 - Full service Ocean View Big Rig RV site. 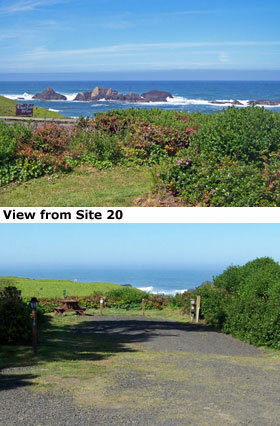 Site 21 - Large Site, Great View, 30-amp but who needs an air conditioner here? 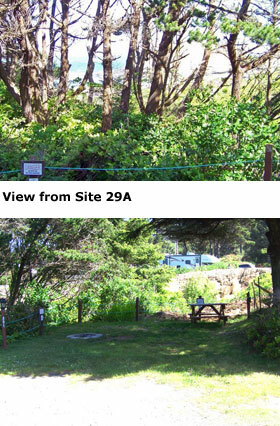 Site 22 - View site. Pull through, enter from west end. 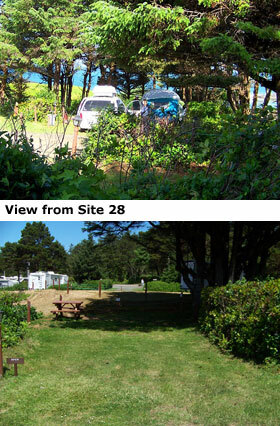 Site 23 - Large View RV Site. Big Rigs love it. 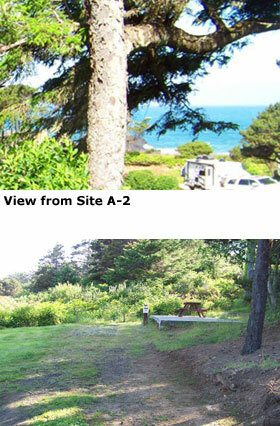 Site 24 - Large view RV site with limited view of ocean. 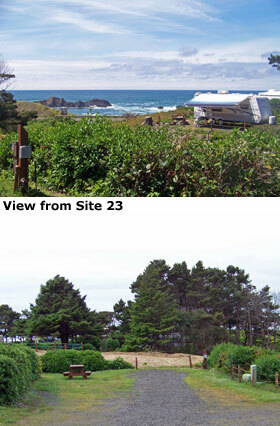 Site 25 - Private RV site. 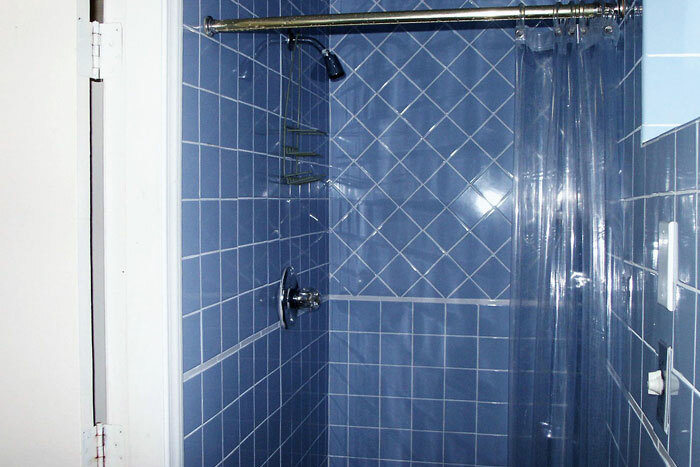 Near restrooms. Site 26 - Tent site with hedges on 3 sides and across from restrooms. Site 27 - Tent site near restrooms. Site 28 - Tent site. 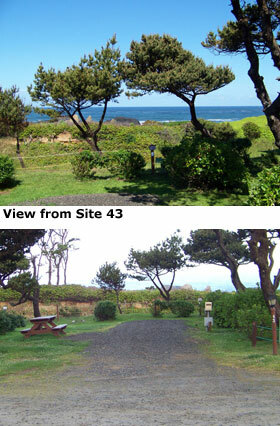 Ocean can be seen from most of tent area. Site 29 - Tent site. 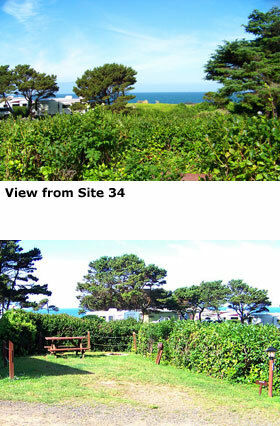 Ocean can be seen from most of tent area. Site 29a - Tent site. 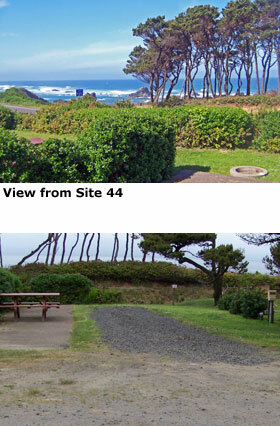 Ocean can be seen from most of tent area. 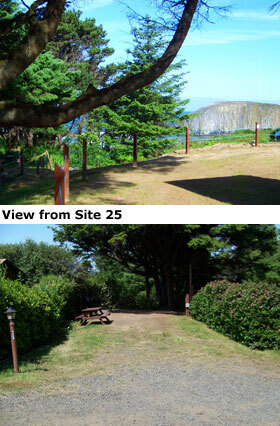 Site 30 - Popular with shade and view of the ocean. 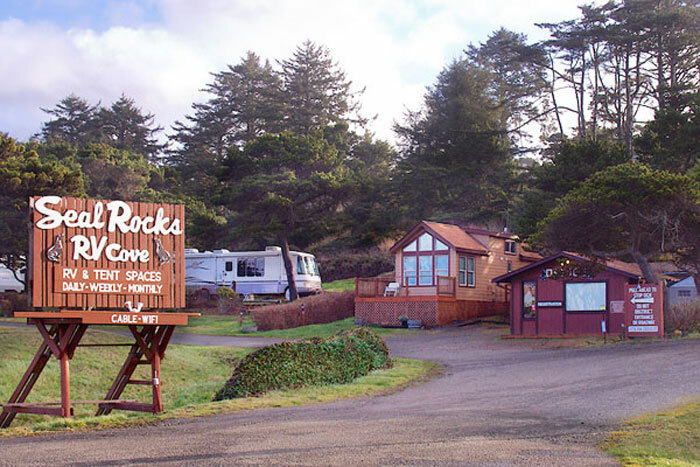 All RV sites have Electricity (30-amp, some have 50-amp), water, sewer hookup, cable, free Wi-Fi, a picnic table and fire ring. 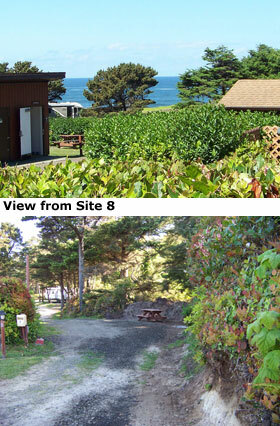 Ocean View Sites (labeled "OV" in tan color on map) offer fantastic views of our beach and ocean. They will experience some noise from the highway. 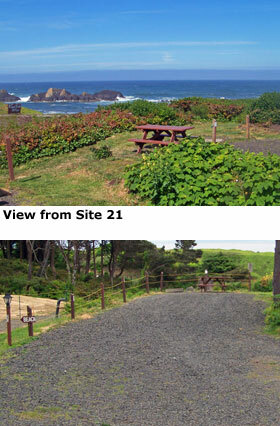 All Tent sites have 20-amp electricity, free Wi-Fi, a picnic table and fire ring, with water nearby. Exceptions: Site A1 has no electricity and there is water available on the site.